If you’re anything like me, you probably use the terms service dog, therapy dog and emotional support dog interchangeably. To be honest, until researching this article, I didn’t know there was a difference. However, these three types of dogs are used in completely different situations. To help clarify, we’ve written this article to explain where you may see a certain type and when someone may need one. 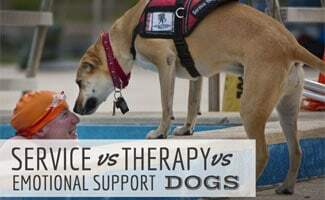 What’s the Difference Between Service, Therapy and Emotional Support Dogs? A service dog is trained to help people with disabilities such as visual impairments, mental illnesses, seizure disorders, diabetes, etc. A therapy dog is trained to provide comfort and affection to people in hospice, disaster areas, retirement homes, hospitals, nursing homes, schools and more. Emotional support dogs provide their owners therapeutic benefits through companionship. The option to use a service dog is given under the Americans with Disabilities Act (ADA) and local governments. According to the ADA, service animals are working animals, not pets. They have been specifically trained to perform tasks related to the disabled person’s specific disabilities. For example, if you are diabetic you may have a dog who can detect when your blood sugar level is too low or high. Training can be done by you, a friend, family member or professional trainer. Service dogs must be on a leash, harnessed or tethered unless it interferes with the service animal’s work or the individual’s disability. Service dogs should be controllable and it is in the individual’s best interest if the dog knows verbal/hand signals such as sit, stay, come, down and heel. The service dog should also be house broken. Simply having a disability isn’t reason enough to categorize your own dog as a service dog. Your service dog must be able to complete tasks that you are unable to complete yourself. Be sure to document training dates and accomplishments in a notebook or online document. Not only will this help you through training, but it will also provide a paper trail for your service dog. Having a professional training certificate or video recording can offer validity if your service dog certification is challenged, but it is not required. If you have a psychiatric service dog, a doctor’s note may be required for airline travel and other public areas. There are two key service dog laws to keep in mind. First, service dogs have to be allowed into businesses and it is illegal for someone to ask about your disability. 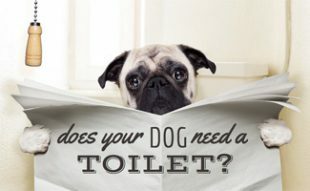 However, someone can ask if the pet is required due to a disability or what tasks your service dog is able to perform. Second, pretending to be disabled to gain access to an area is against the law. Service dog registration is not required by the ADA. Please do not pet service animals while they are working. The man in the video below has some more thoughts and tips based on his experience with a service animal. Therapy dogs are used in facilities to comfort people and give affection. Spending time with a therapy dog has been shown to lower blood pressure and heart rate, reduce anxiety and increase endorphins and oxytocin. Therapy dogs do not have to be trained to perform specific tasks like service dogs. Are you asking yourself, “Can my dog be a therapy dog?” It’s important to first state that not all dogs are good candidates to be therapy dogs. Therapy dogs should be naturally calm as well as affectionate and friendly to strangers. They need to be obedient in addition to having regular wellness check-ups and also be well-groomed for each visit. Your emotional support dog should be devoted to you and responsive to your emotions and commands. The dog should also be calm and laid back. A rambunctious dog has the capability of becoming an emotional support dog, but it will require more training. It is recommended to look for a dog that is around one year old so you can build that relationship with him and have him be out of his curious puppy phase. However, puppies can be emotional support animals as well; they’ll just need to be a breed that is people-oriented (e.g. Labrador retrievers, golden retrievers, Goldendoodle, poodle, etc.). Learn more about emotional support animals. What Kind of Dog Is Needed? We thought it’d be fun to “quiz” you to see if you can distinguish which type of dog is appropriate for various scenarios. Test your knowledge below. Q: What kind of dog helps a person when they experience social anxiety while flying? Q: What kind of dog is needed at school to help children experiencing anxiety? Q: What kind of dog is needed to pull a wheelchair? Q: What kind of dog offers companionship in day-to-day activities for one person? Q: What kind of dog is needed to protect someone who is having a seizure? Q: What kind of dog is needed to remind a person with mental illness to take their prescription? Q: What dog helps a person with autism? Q: What kind of dog works with numerous people? Q: What kind of dog calms a person with Post Traumatic Stress Disorder? What do you feel best defines the different characteristics for each type of dog? I thought it was interesting that you mentioned a service dog can help detect when your blood sugar is low if you’re diabetic. I never thought that a dog would be able to do something like that. It’s simply amazing what these animals are capable of. Thank you for clarifing the difference. I get into arguments with people about this. My husband has a note from his nuerologist to be allowed to have a dog. The note states that a dog would benefit him due to having a nuerological disorder essential tremor. His dog helps him keep calm . What category would this dog come under? I say an emotional support dog. If you are unsure of the classification of your dog, I would suggest that you ask your doctor. Unfortunately, there is not a clear answer because there is a lot of disagreement in cases like this where it is a brain-associated condition rather than a purely physical one. So only your doctor could make this determination or a trainer who raises these pups to help in the respective fields. Best rule of thumb that I’ve been taught over the years…in order for the dog to be considered a Service Dog and be covered under the ADA, the dog must be “task” trained. In other words, the dog provides some task that the owner is in need of regularly (out in public). Making someone “stay calm” would not fall under the title of a service dog unless the dog actually performs some sort of task to help keep someone calm. A good example of that would be a dog that is trained to lay over top of someone that is suffering from PTSD symptoms to help mitigate an episode of fear or anxiety. Lori, very well informed post. Thank you. Another “task” a service dog may provide for a Veteran with PTSD is “Impulse Interruption”. I am a Veteran and assist fellow Veterans in training their service dog. It’s called a “trigger”. A vet may get into a stress situation where a trigger goes off, instantly filling his/her brain with cortisol and other stress hormones. This in turn pushes them back into the battle zone and they lash out in a blind survival instinct. The service dog instantly recognizes the scent as a negative and jumps on them, barks at them, which interrupts that impulse to lash out in a rage. That’s amazing, but it gets better. When the Vet turns to his dog hug them, pets them his/her brain fills with Oxytocin, Serotonin and Dopamine. This instantly calms the Vet and they go about their way! All dogs are just wonderful! Dogs are my passion. Therapy dogs are my obsession. Service dogs are my compulsion. In whatever category we may list our pets, something common amongst the three is, they understand our feelings and react accordingly. They can’t speak in our dialect, but can response. Therapy pets play most crucial role as they have to work for a master who does not convey under the conditions of a healthy mind. I had the opportunity to avail the service of a therapy petfor my aged grandma. She was recovering from a trauma & the therapy was recommended by experienced doctors at Steady Care Medical. The result was astonishingly encouraging. ESA therapy for the patient not keeping a good mental health is getting popular day after day. With the passage of years, not only our physical, but mental health is alsoweakened. Besides, there are situations when we get over stressed or land ourselves in depression. These are a few situations when we need the company of an ESA. But an important aspect that you should keep in mind is, not to forget to obtain a recommendation letter from an experienced and licensed mental health specialist lest you are thrown out of your rented accommodation or the Airline crew declines your request to board your ESA. I have had to face such a situation and it’s well-known mental health specialists, Pet Support Doctors, who provided me an ESA letter online and helped me in need. My 7 yr old boxer is my life and she honestly keeps myself calm qnd collective at times and truly keeps my emotional state in a positive mannor. Having ptsd, my anger flies off the edge into deep water to the point that i want to take extreme actions qt the time of something happening and if it was not for her, i would be in a bad situqtion. Instantly, her happiness and joy with me doesn’t allow my mental state take advantage and put myself in bad situations but instead and knowing she is with me, i rethink qbout what actions i want to take qnd it makes me tqke the best course of actions. I absolutely owe her my life and she has made the best of life for my life. I would be so lost without her! Hi, I think you are a bit confused. The AKC does NOT register therapy dogs but rather recognizes a number of therapy dog registries that can be found here. Exactly…AKC only hands out titles for the number of visits you make. Titles you pay for at $20 a pop. Make sure that you get registered and/or certified with a National organization!! What helps you calm down from a anxiety attack? I’m having a little trouble figuring out on how to contact trainers for what I need. .I have anxiety,ptsd and depression. I often have times where I have panic attacks and will disconnect from reality thus avoiding meds and signals from myself that I need to leave the situation. I’ve heard people have service animals for their anxiety by alerting their owner from certain things that might be a trigger,but I also hear people bring up ESA and I was trying to figure out what would be best for me? Any help would be much appreciated and thanks in advance! Have you tried speaking to your doctor about this? I’m confused! My husband and I own a dinner theater – a venue that typically wouldn’t permit animals of any kind. Can you please tell me which type of dog (or miniature horse?!) we are required by ADA law to let in? Thank you! This link may be helpful for you to learn more. That’s really cool that a service dog can actually detect when a diabetic has low or high blood sugar. It’d probably be a good idea to use something like a golden retriever or Labrador because they already tend to be happy and useful breeds. You’d just need to find out how you could make your dog be a service dog. I think all three of these working dogs require unique skills that help them do their jobs. Each job keep a role in making life just a little bit easier for the people who love and need them. Can a dog be both an emotional support animal and a trained therapy dog? yes, i am also trying to understand if a dog could wear multiple hats. did you find an answer? Yes, there is nothing stating that an ESA that helps you at home, couldn’t be trained to visit with other people as a therapy dog. I will say though, that the dogs that excel in therapy work are the ones that are always looking for attention. So, those that are good ESA’s aren’t always necessarily well suited for therapy work. I have a St John’s Ambulance (Canadian) certified therapy dog. He is certified to work with seniors and children. The evaluations are very different for either group. As others in the discussion have said, the therapy dog works with many, many people. That is their strength. 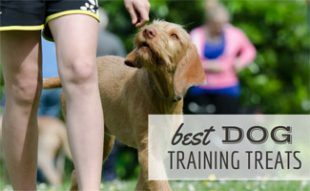 The training for a therapy dog is much different than for other task oriented dogs. It is mostly socializing a pup with many people and watching for the desired behaviour of empathy. It’s not something that all dogs have. When that happens give big praises to the dog, but not necessarily treats. Early on the dog recognizes the situations that earn the most praise. The most important training is complete obedience to the handler. A good therapy dog recognises stress in people of all ages and wants to comfort that person. What I’ve seen is that most comforting situations last from a few minutes to around ten minutes. The dog knows when it has done its job. During that time you can almost see the person relax inside. It’s very rewarding. My pouch and I visit senior homes and attend a program in elementary school called Paws for Stories. He helps relieve the child of anxiety while reading out loud. It really works!!! I think many people are faking the need for emotional support dogs. They seem to be everywhere now. “There are many sites out there that sell emotional support animal letters” – exactly, anybody can buy one on line. People just seem to want to take their animals everywhere so they are getting these “letters.” It’s ridiculous and there should be some other qualifications put in place to stop this. Takes away from people who really need these animals. Emotional Support Animals can not go into businesses that are no pets allowed because they are not task trained. Also ESA’s do not have to have any training. They can go on a plane- no training at all required. A little girl was just attacked at an airport by one yesterday I believe. A pit bull. Colleen, please provide details to the above incident. I would like to research and find out exactly what happened. Unfortunately when these type of incidents happen the first to get “blamed” is the dog. What we, as a society, fail to understand is that Pit Bull has a human owner. The owner is solely responsible for their dog behavior. The owner does not have a dog problem, the dog has a owner problem. My heart goes out to the Pit Bull, if true the Pit is dealing with some serious anxiety/stress issues and the owner has not helped him. Sue the owner, that’s why we have courts. If enough bad/ignorant/misinformed ownwers get sued, the problem will go away. Pit Bulls are dogs. Nice article.It’s wonderful and interesting. Only service dogs fall under the American With Disabilities Act which means they have to be allowed into businesses. Emotional support & Therapy dogs do not. Per ADA website, ” Under the ADA, a service animal is defined as a dog that has been individually trained to do work or perform tasks for an individual with a disability. The task(s) performed by the dog must be directly related to the person’s disability. ” Staff at a business can ask 2 questions if it is questionable if the dog is a service dog. (1) is the dog a service animal required because of a disability? and (2) what work or task has the dog been trained to perform? Thank you Lizzie for further clarifying this. We made some minor updates to this article based on your specific details. Really?? you made ‘updates’ to your article based on ‘Lizzie’s’ information? Doesn’t matter if Lizzie is right or wrong. the fact that you would update your article based on someone’s comment in the comment section .. This is whats wrong with articles today. folks just write them based on what someone says and NOT by researching the information themselves. Don’t you think it would behoove all of us, if the information was verified as correct? way to many articles are written and not confirmed/verified information. Nothing against Lizzie, i’m sure her info is ‘correct’ ( I say that because I haven’t verified it ) .. But my issue is with the article writer who will make changes to an article just based on a users comment. it’s just LAZY writing. CONFIRM your articles information. don’t just take Jane Doe’s or John Does word for something. this is how Miss information travels so darn fast these days !!! To clarify, we didn’t take Lizzie’s comment as 100% truth. We always fact check prior to editing our articles. We felt that was understood and didn’t need to be written about in the comment section. The great thing about our website is that we offer free content and listen to our readers when they make a suggestion or edit to our articles. We understand that we can have errors or not explain things as clearly as we could the first time, which is why we listen to our readers when they make a suggestion. We then research further and make any appropriate edits we deem necessary. I’m sorry you assumed that we took Lizzie’s information as fact, but that is not what we do here at Canine Journal. I have an registered emotional support dog. I now have seizures and cancer. This dog knows before I do that a seizure is coming plus stays by my side when my cancer is causing a bad day. Does this mean I can now call him a service dog? If so, what is my next step. I am disabled and money is tight. I know longer can drive because of seizure. If you have a seizure disorder then you could have a service dog. I recommend speaking with your doctor about how to register your dog as a service dog since the laws vary by state. ADA Americans With Disabilities Federal Law clearly states there is no registration/certification needed for a service dog. It also clearly states you can train your own dog. There are numerous reasons the Lawmakers set it up this way. One of which is cost. Generally speaking people with disabilities do not have a lot of money. The cost to train a Guide dog $25,000-$35,000, a PTSD service dog $10,000-$20,000, an autistic service dog $10,000-$20,000 so on and so forth. In addition, there is usually a waiting list of several months if not years. If the only service dogs aloud were professionally trained dogs, tens of thousands of disabled persons would suffer and in some cases even die without their dogs assistance. You are half right on this on Kimberly (assuming no correction occurs later in discussion). ADA Federal Law clearly states there is no registration/certification of service dogs. A state may create a law saying you must register/certify a service dog with that state, but it is a meaningless, unenforceable law. Federal Law ALWAYS supersedes state law, county law, municipal law/codes. Yes Kimberly, seizure disorders do qualify a service dogs as the Task they perform is medical alert. Alerting the owner to a oncoming seizure, minutes before they occur. ADA federal Law always supersedes state, county, and local law. So even if the state has a law saying you have to register your service dog it is meaningless and unenforceable. And if the state insisted in implementing such a law they could be sued/fined by the Department of Justice or federal court. Interesting enough, each state usually does create their own service dog laws. For example in California, Penal code 365.6 clearly states if you interfere/harass/obstruct/ in any way a service dog performing its duties, you are guilty of a misdemeanor crime, subject to 6 months jail, $2500.00 fine. Also in California, Penal code 365.7 states if you misrepresent your dog as a service dog (crime of fraud), 6 months jail and a $1000.00 fine. Are all of these types of helpful dogs called working dogs? Yes, sort of. Because ESA’s work is typically at home (or strictly on flights), they aren’t really (or aren’t SUPPOSED to be) in the general population. Where as the Service Dogs most certainly are considered a working dog and the Therapy Dogs are to a certain extent (where they are invited in to hospital, nursing homes, etc). Other working dogs are Police K-9’s and Search and Rescue Dogs. You’re still quite confused on some facts. No, an emotional support animal does not help with social anxiety in a store. Only housing and airplanes are legally obligated to allow ESAs. Stores, restaurants, etc don’t have to let them in. Service dogs absolutely exist to help people with autism. Your vague quiz question is not necessarily accurate. Please continue to check into further information before you decide you’re capable of answering others’ questions on this subject. Hi Diana, thank you for taking the time to comment. Here are some resources we found supporting our information. Actually, Kimberly is right in many cases. Also, there is a huge difference between “service animals” vs. “emotional support animals”. Support animals need to go through training in order to be properly certified to received their title. Emotional support animals on the other hand do not need to go through training. As Kimberly mentioned, there are many sites out there (https://therapypet.org/blog/how-to-get-a-doctor-to-prescribe-an-esa/ , https://www.emotionalsupportanimalco.com/ , etc. ) that sell emotional support animal letters – which basically is a legal doctor or therapist note saying the individual who we given the letter could benefits from having a therapy animal. These letters sold online, if purchases through a reputable company, DO work for housing and airplane travel. Hi Mike thanks for the comment and adding to the discussion. I completely agree that this topic is important to many people. So which ones are reputable? I have seen some saying for $175 they will do it others want a donation. Still others want you to buy so much other stuff to go along with the letter. My dog is registered as SERVICE DOG, both for ME and MY DISABILITY, BUT FOR MY TWO DISABLED DAUGHTERS WITH AUTISM AND SENSORY PROCESSING DISORDER!! And registering your animal as a SERVICE DOG / ANIMAL is PROTECTED UNDER THE ADA (Americans with Disabilities Act) which DOES NOT VARY BY STATE as you say. 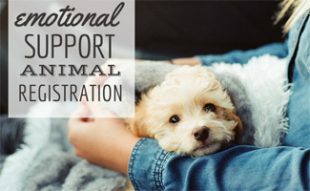 If you have a Dog that was once used as an EMOTIONAL SUPPORT ANIMAL but now realize and become DISABLED, then all you have to do is (recommended training if needed by yourself or friend), and RECATAGORIZE DOG AS SERVICE DOG and you can do this for FREE online – and again, DOES NOT HAVE LAWS THAT VARY BY STATE AS ONCE YOU ARE DISABLED, THAT IS FEDERALLY PROTECTED!! Please fact check THIS, nothing at all is needed by your doctor with SERVICE ANIMAL – and won’t cost you ANYTHING to register online (and ADA doesn’t even require that, we did it so that we could have our dog on the registry and get SERVICE ANIMAL VEST)! Does no one perform proper research and investigation into the subject they write about anymore? Gads, the inaccuracies are mind numbing. I lost IQ points just reading it. It’s not like the proper information is hidden away in some locked vault in the Andes mountains. With a simple Google search, looking for a url ending in ‘.gov’, all the pertinent laws are readily and easily accessed through a wide variety of media devices. Sheesh, people. I certainly hope you didn’t pay a lot for tuition at college for journalism classes. What a colossal waste if you did, as it is obvious that the correct methods of research and investigation were not covered. Hi Todd, your comment doesn’t include any information about what exactly is incorrect in this article. Can you point out any inaccuracies we have in this article so we can do our best to display correct information? My apologies for any wrong information there is in this article and I appreciate your patience as we try to correct any information. Nice article (some things a little wrong) but the one major thing you got wrong (and hopefully you will correct your article) is ther is NO SUCH THING AS A REGISTERY in the US. This places pop up online and charge money for something that no one with a legitimate Service Dog or Emotional Support Animal needs. Also people with Autism also use services dogs. As long as the dog has at least one trained task to mitigate the handler’s disability (and is good in the public) the dog is a Service Dog. Thank you for bringing this to our attention Laura. We had another person comment just a couple hours before you with similar information. We will be sure to update our article! Thanks again! there you go .. 2 people said it. so update the article.. Hey update your article on this .. cuz I’m gonna say it. so it’s gotta be true.. Cats are better service animals than dogs . ( make sure to update your article with that information now.. )..
seriously. STOP updating your article on what PEOPLE SAY.. as you notice some of those answers are WRONG ..
DO YOUR Research .. DON’T update it because someone says ..
pursuant to HB2580 the NEW added Section K . with new laws going into effect in 90 days .. all service animals must be AKC certified. Anyone can write anything in these comments. Thank you for bringing this to our attention Matt. We will be sure to update our article!